Call Now and choose from Single, Double, & King Size beds and mattresses available in many different ranges! Cant be beaten on Price or Quality – Pay Cash on Delivery. Take control of your comfort – ORDER NOW! Buy directly from the manufacturer. Great British Craftsmanship – giving you a super comfortable memory mattress finished in natural Cotton and Resilient White Fibre. Whilst our beds are handmade by our master craftsmen to give you a gorgeous centrepiece for you bedroom … and sleep beautifully. The Budget RANGE – part of our popular ‘budget’ range, ideal for first time buys, childern and guest rooms. 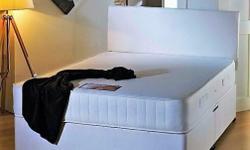 Open coil spring mattress with a soft feel and a lightly quilted cover. The Meduim RANGE – features a traditional spring gauge, with multiple layers of fillings and upholstered in hard wearing damask cloth. The ORTHO RANGE – Our orthopaedic divan gives you great support. The 12.5g spring system is accompanied by layers of polyester fillings to give you support and comfort and a great nights sleep. The Memory RANGE – Our luxurious choice brings you the ultimate in comfort and support. 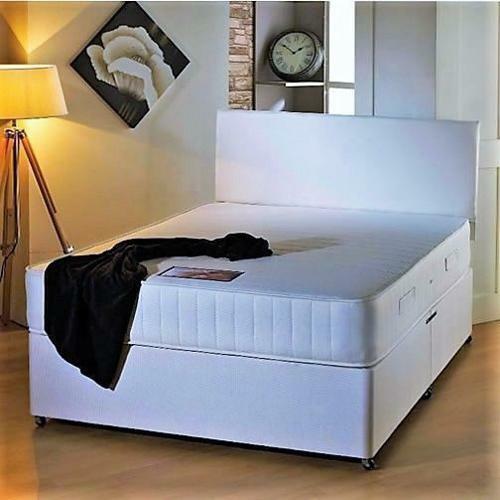 The memory foam option offers a soft feel surface that will mould to your pressure points giving the bed a luxurious feel. Choose the headboard and divan style, then the upholstery from fabric or leather and a choice of 7 colours (brown, black, white, cream, red, pink and grey). Set on wheel castors for easy manoeuvrability, our divan bases also offer practical storage options.